Bunnies and chickies may seem like the perfect addition to your child’s Easter photoshoot, but any single one of these reasons should have you thinking twice before bringing an animal into your home as an Easter prop. 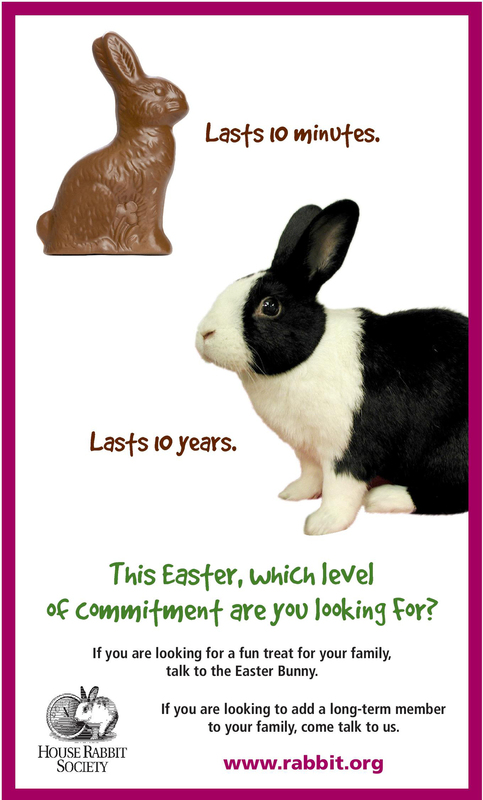 A new bunny or small chick are 10 year commitments: These animals have 10 year life-spans, with some living even longer. If you are not prepared to commit the time and care needed for these animals for 10 whole years, do not buy one this Easter. Rabbits can get quite large and chicks do not stay yellow and fluffy as chickens: That’s right, these animals will grow up and not be cute little babies any more. Both Rabbits and chickens require veterinary care: Vaccines, physical exams, an annual testings are needed to keep these animals healthy and can come at a high monetary cost. Most veterinarians do not treat rabbits or avian patients: You better do your research to see if any of your local veterinarians have the training and expertise to treat these animals! Bunnies and chicks are fragile: You or your children may mishandle them, resulting in their death. Nothing ruins Easter like a child upset because the bunny won’t wake up after being dropped. Both of these animals need proper enclosures: These animals cannot be confined to a small cage. Rabbits need to run and burrow while chickens need to be able to roam and stretch their wings. Proper enclosures are expensive and must be cleaned daily. Rabbits and chickens have specific dietary needs: And their dietary needs may differ from one rabbit to the next, or one chicken to the next. Without proper feed that provides the nutrients they need, these animals are sure to fall ill.
Rabbits have teeth and claws. Chicks have sharp beaks. They may injure you or your children: That’s right. These cute little critters may bite, scratch, or peck at your child should they feel threatened or in pain. They can be health hazards to humans (especially chicks): Unvaccinated animals are capable of transmitting diseases to you or your kids. Chicks in particular are often a common vector for Salmonella. Buying animals for a holiday is supporting potential animal cruelty and teaches children that animals are to be bought like toys rather than adopted like living beings. Animal shelters across the country see a rapid spike in the intake of rabbits (and some experience this with chicks as well) in the weeks following Easter. Don’t contribute to that statistic and let’s respect these animals on Easter Sunday! Say it again Sam... My name is Sam, I was rescued by my humans from the streets of Los Angeles, California and am now living La Dolce Vita in Sin City USA, Nevada. "I’ll reach for your hand in the cold of winter, I’ll reach for your hand in the heat of summer. But if my short life can’t reach the dawn of spring, I promise, in heaven, I’ll reach you with my wings…”. I adopted her knowing that she was FIP positive. She was with us for 2 wonderful years. Image source: @rescuersclub re-posted/re-tweeted and mirrored at my Instagram and Twitter accounts.